Hailing the move, Donald Trump tweeted, "The United Nations Security Council just voted 15-0 in favor of additional Sanctions on North Korea. The World wants Peace, not Death!" 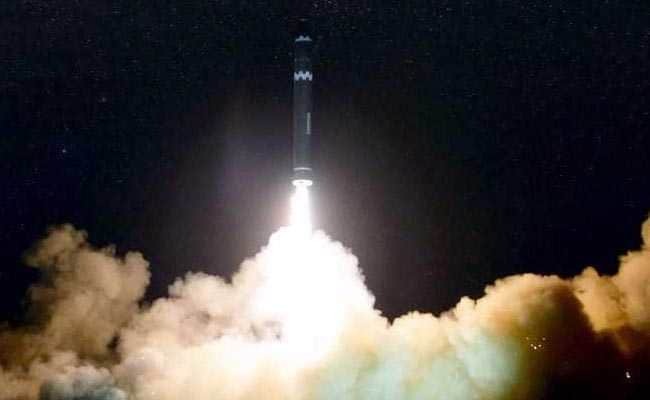 United Nations, United States: With China's backing, the UN Security Council on Friday slapped new sanctions on North Korea that will restrict oil supplies vital for Pyongyang's missile and nuclear programs. The council unanimously adopted a US-drafted resolution that also orders the repatriation of North Korean workers sent abroad to earn revenue for Kim Jong-Un's regime. It is the third raft of sanctions imposed on Pyongyang this year and comes as the United States and North Korea show no signs they are willing to open talks on ending the crisis on the Korean peninsula. US President Donald Trump Friday hailed the move, saying the international community was pushing for peace with the isolated regime. "The United Nations Security Council just voted 15-0 in favor of additional Sanctions on North Korea. The World wants Peace, not Death!" Trump tweeted. The resolution bans the supply of nearly 75 percent of refined oil products to North Korea, puts a cap on crude deliveries and orders all North Korean nationals working abroad to be sent back by the end of 2019. The United States put forward the draft text on Thursday following negotiations with China, Pyongyang's ally and main supplier of oil. Describing North Korea as "the most tragic example of evil in the modern world," US Ambassador Nikki Haley said the new sanctions are "a reflection of the international outrage at the Kim regime's actions." The resolution "sends the unambiguous message to Pyongyang that further defiance will invite further punishment and isolation," she said. The measures are in response to North Korea's test of an intercontinental ballistic missile (ICBM) on November 28 that marked an advance in Pyongyang's drive to threaten the US mainland with a nuclear strike. Trump has threatened to "totally destroy" North Korea if it attacks the United States while North Korea insists the world must now accept that it is a nuclear power. Last month, Trump asked Chinese President Xi Jinping to cut off oil to the North, a move that would cripple its struggling economy. Crude oil supplies were capped at four million barrels per year and a ceiling of 500,000 barrels of refined petroleum products, including diesel and kerosene, was set for next year, down from two million barrels in a previous resolution. If North Korea carries out another nuclear or ICBM test, "then the Security Council will take action to restrict further the export to the DPRK of petroleum," said the resolution. The United States had initially sought to expel within a year tens of thousands of North Koreans, most of whom are working in Russia and China, but that deadline was extended to two years after Russia objected. To prevent North Korea from circumventing sanctions, all countries were authorized to seize, inspect and impound ships suspected of carrying illegal cargo to and from North Korea. The measure bans sales of all industrial machinery, trucks, iron, steel and other metals to North Korea and bars exports of food, machinery, electrical equipment, earth, stone, wood and vessels produced in the reclusive state. Addressing the council, China and Russia condemned North Korea's behavior but made the case for urgently opening diplomatic channels to ease tensions and move towards settling the crisis. "Sanctions are only a means," said Chinese Deputy Ambassador Wu Haitao. "One should not expect to settle the problems through unilateral sanctions or pressure." "We all must, we are all duty-bound, to provide opportunities for diplomacy to function," said Russian Deputy Ambassador Vladimir Safronkov. A total of 15 North Korean officials, most of whom work in banking, were added to the UN sanctions blacklist along with the ministry of the people's armed forces, which manages army logistics for the country. An earlier list contained 19 names, later reduced to 16, but a final version listed 15 North Koreans, who will be subjected to a global visa ban and assets freeze. Since September last year, North Korea has carried out its sixth and largest nuclear test and a series of advanced missile launches which are banned under UN resolutions. The United States has led the drive at the Security Council to tighten sanctions aimed at piling pressure on Kim's regime to come to the negotiating table. French Ambassador Francois Delattre welcomed the new measures, saying "this resolution bites." "Maximum firmness today is our best antidote to the risk of war," he said. The European Union said in a statement that it too is planning to adopt tougher sanctions against North Korea early next year.